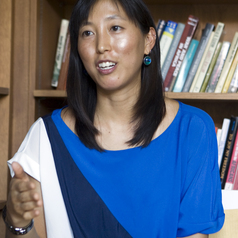 A. Naomi Paik is an assistant professor of Asian American studies at the University of Illinois, Urbana-Champaign. Her book, Rightlessness: Testimony and Redress in U.S. Prison Camps since World War II (UNC Press, 2016; winner, best book in history, Association of American Studies, 2018; runner up, John Hope Franklin prize for best book in American studies, American Studies Association, 2017), reads testimonial narratives of subjects rendered rightless by the U.S. state through their imprisonment in camps. She has published articles in Social Text, Radical History Review, Cultural Dynamics, Race & Class, and the collection Guantánamo and American Empire and has forthcoming articles in Humanity and e-misferica. She is currently writing Walls, Bans, Raids, Sanctuary, a short book on the criminalization of migrants in the U.S. and radical sanctuary movements. She is also developing a new project on military outsourcing. Her research and teaching interests include comparative ethnic studies; U.S. imperialism; U.S. militarism; social and cultural approaches to legal studies; transnational and women of color feminisms; carceral spaces; and labor, race, and migration.